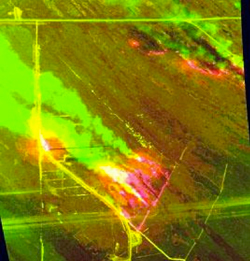 CSS developed the Fire Management and Analysis Network (FireMAN) as a decision support tool to increase the effectiveness of the NASA fire management program, to minimize the effects of smoke, and to prevent the loss of life and property on the Merritt Island National Wildlife Refuge, John F. Kennedy Space Center, and Cape Canaveral Air Force Station. Fire is frequently introduced under controlled conditions (prescribed burning) at these locations to reduce fuel loads and to restore natural habitats that are fire evolved and fire dependent. FireMAN is a centralized, high-resolution, real-time system that provides ready access to relevant information for prescribed burns and wildfire response. Information is made available through a Geographic Information System (GIS) and the internet. Landscape, fuel, weather, fire, and smoke models are integrated with decision support techniques into a common working environment. Models describe current and forecasted fire potential, weather, flame front rate of speed and intensity, and smoke production and dispersion. Links to current and planned cultural and industrial operational activities at the federal facilities provide a means to assess risks. The application supports fire prescription development, coordination of operational activities affected by controlled burning, long-term ecosystem management, and risk analysis associated with controlled burning and wildfire response.